Engaging your constituents and building good relationships takes a lot of work. If you are looking to improve your online communications and content, Convio recently shared a great list of suggestions about different types of content you can send to your supporters, and how often should you send it in order to maximize open rates, click-thru rates and, ultimately, fundraising. There’s a lot of debate within organizations about the value of enewsletters. 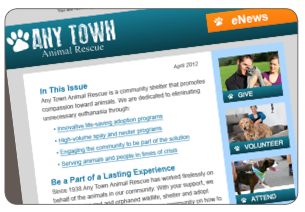 If you’re an organization that produces a lot of content and has multiple campaigns or program initiatives happening, a monthly or even a quarterly enewsletter can be an effective way to summarize these events and tell activists and donors how they can get more involved. “The key here is not just to be regular, but to offer high- quality, engaging content," said Convio. A personal eLetter from a prominent leader (like the President) in the organization is a great way to send an urgent appeal or even thank your supporters for their help in meeting a major fundraising goal or winning a campaign victory. An eLetter’s tone can help make your email communications more personal and less formulaic then standard appeals. During an urgent and deadline driven campaign. As part of a campaign wrap-up. Who doesn’t like to be thanked or invited to special events? eCards has a single focus, but with an emphasis on visual design. eCards include timely topics like a save the date to an important event, an announcement that your annual report is available online, or a holiday card. In terms of timing your overall online communications with advocates and donors, you’ll see the best results if you email them at least once a month, but the content must be valuable. Don’t email them, just for the sake of getting something delivered to their inboxes. Nobody likes to read boring or meaningless emails, so don't waste their time. Some organizations have had success emailing their list as much as once a week, but it’s recommended that you test your timing and frequency to see what generated the best open, click-thru, and response rates. A good baseline is 19% for open rates, and 4% for click-thru rates. And don't forget that for each email you send out, people will unsubscribe. These rates are at about 0.41% per email. What are some of your favorite tips to communicate with your advocates and donors online?